Thanksgiving is one of my favorite holidays. I know it gets kind of lost in the holiday shuffle – it’s kind of the wallflower at the party. But there’s something pretty special about a holiday that makes us (or should anyway) stop and take a look at all the things we are thankful for. Not to mention all that pumpkin pie. I’m thankful for that. I wanted to focus more on Thanksgiving this year – take some time this month to really think about the ways we are blessed. And of course have fun with it too since we are a pretty goofy bunch. I came up with this Give Thanks! 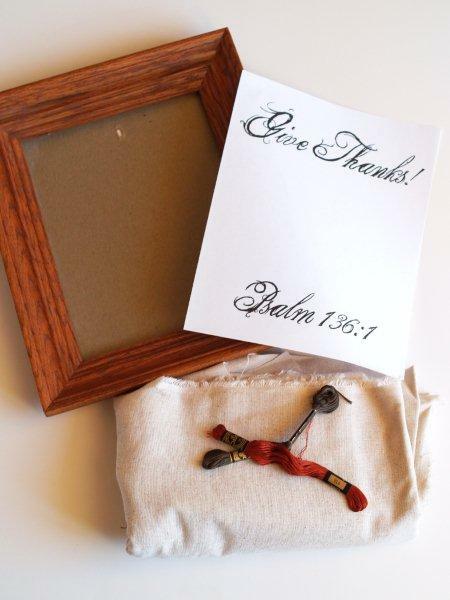 Frame to help us keep track of things we’re thankful for . . . It has glass over the embroidery so we can write different things all month. This is super quick and easy – but I have a tutorial for you if you’d like to make one too! To make tracing your design onto the fabric easier, tape the paper onto a window that has light coming through it, then tape your fabric over that. The design should be pretty easy to trace at that point. I embroidered all the letters with a stem stitch. Here is a quick lesson in case you need it. 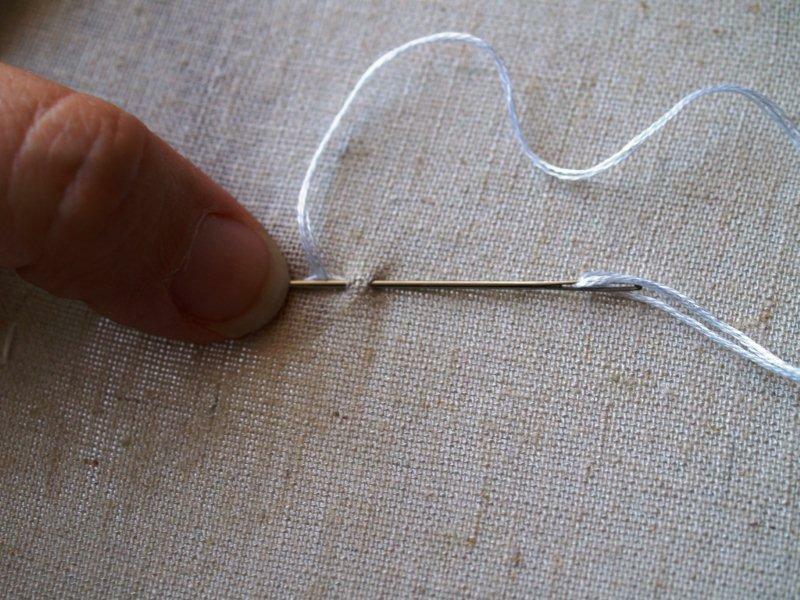 With your fabric in your embroidery hoop, knot your thread and bring it up from the back of your fabric. Using the picture below, the point where your thread comes up is “A”. Insert your needle at “B” and bring it back out at “C”. The distance between A, B, & C should be the equal. 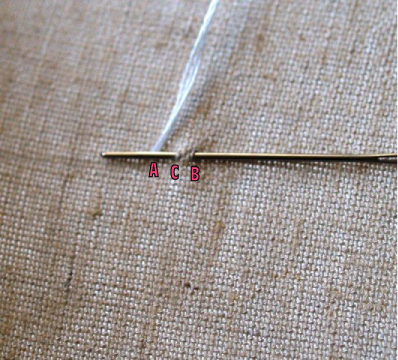 Keep your loose thread above the stitch, and repeat, following the picture below. 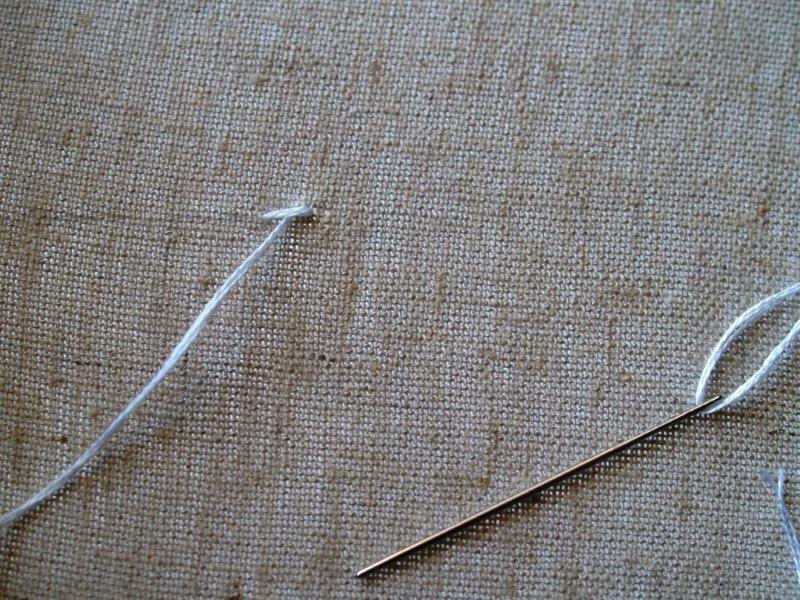 Your needle will come out at a point touching the end of the previous stitch. Continue stitching this way following all lines and curves. 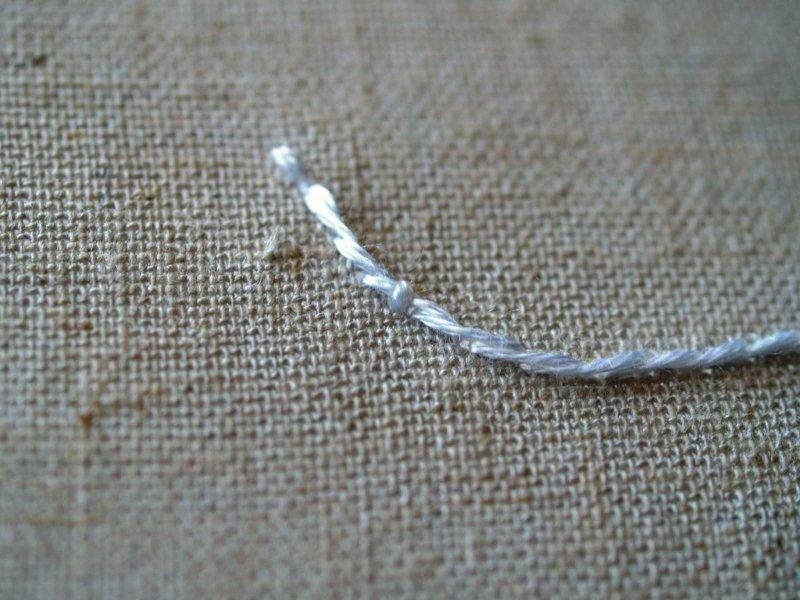 If your stitches start to “fall” or don’t lay flat on a curve, do a small stitch around the stem stitch to hold it in place. Here is the finished lettering. 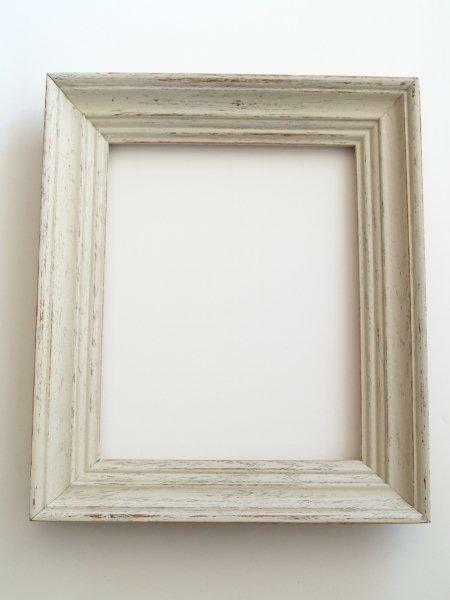 Cut a piece of posterboard or scrap cardboard to fit your frame. Attach your fabric to the posterboard. I used a spray adhesive for this but you could use any type of glue. If you have a frame you like you can skip this next few steps. I did not have a frame I liked. 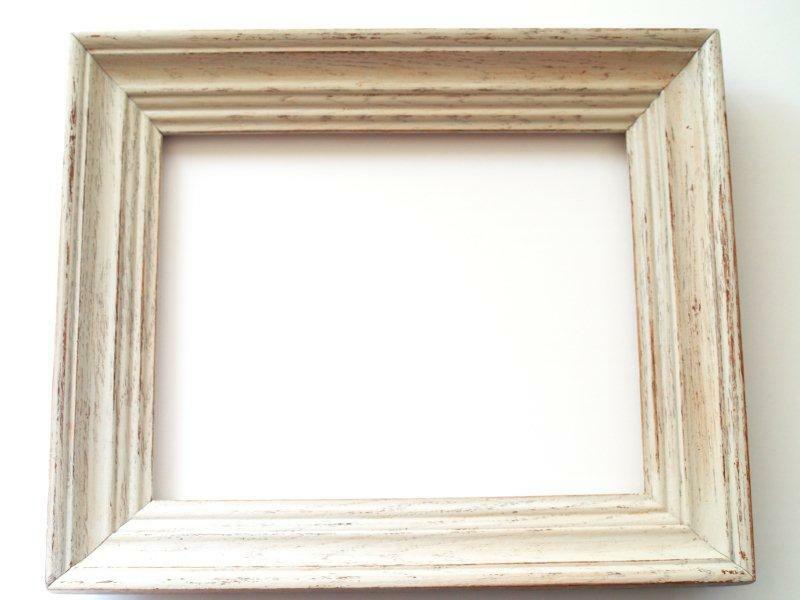 I pulled out an old oak frame that had pretty moulding and spray painted it cream. Here it is in its little spray paint house. 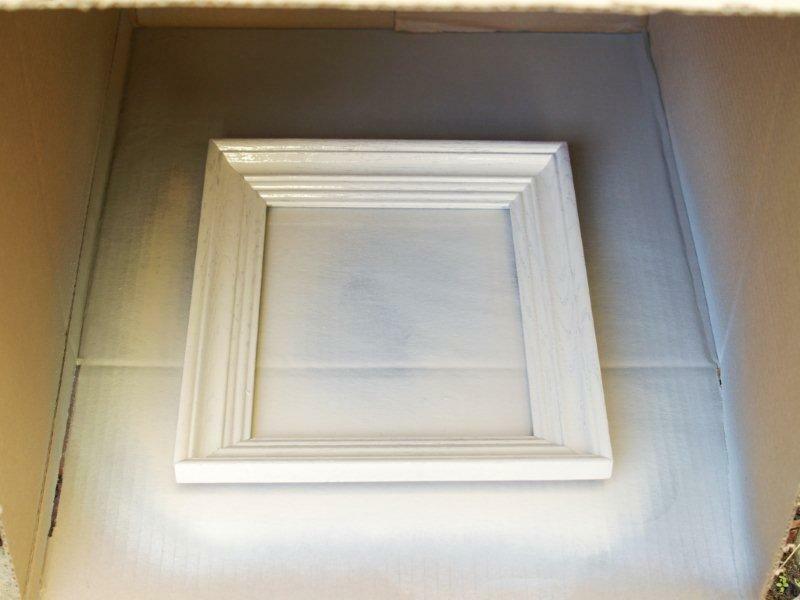 Because I’m cheap resourceful – the only cream spraypaint I had on hand was plastic spray paint. Which left the frame rather shiny. I sanded it up a bit to give it a more shabby look. That’s pretty good but I wanted to take the age-ing just a bit further. 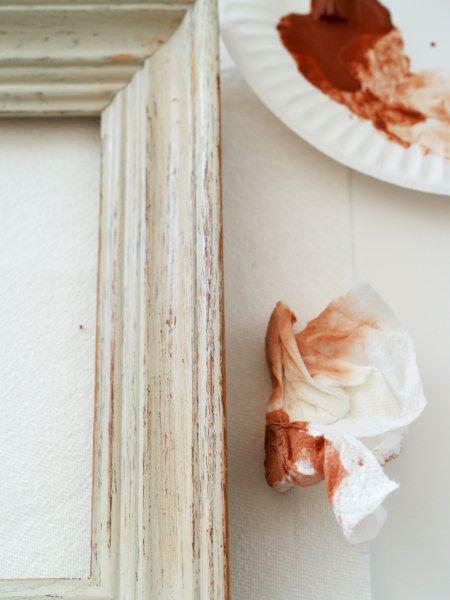 I watered down some Burnt Sienna craft paint and used a damp paper towel to lightly rub the paint over the frame. Kind of like a stain. This took just a bit more of the gloss off and gave it a “warmer” tone if that makes any sense. Put the embroidery in the frame and put the backing back on it. Now you have a great way to write down all your blessings this month! Here it is on our little entry way table. Obviously we have some jokers here. Which is all good. Yes. That says Bacon and Hot Bloggers. Here’s a window to my world. My plan is to erase it every few days and have everyone write new things down. Some days we’ll do a theme – everyone has to pick something they are thankful for on a particular subject. What do you think? How do you celebrate Thanksgiving? Oh – and a peek into this week. I want to thank everyone who chimed in the Bloggy update post – your responses meant A LOT to me. We will be keeping the willy nilly approach for now – but I do have a few things scheduled this week so I’ll share them now and you can get all excited. Coming up tomorrow we have a super sweet giveaway and later in the week we have a Thanksgiving Craft for kiddos – or childish adults and a guest post at Me Making Do for her Crafty Creative Christmas Week. So make sure to check back in!! 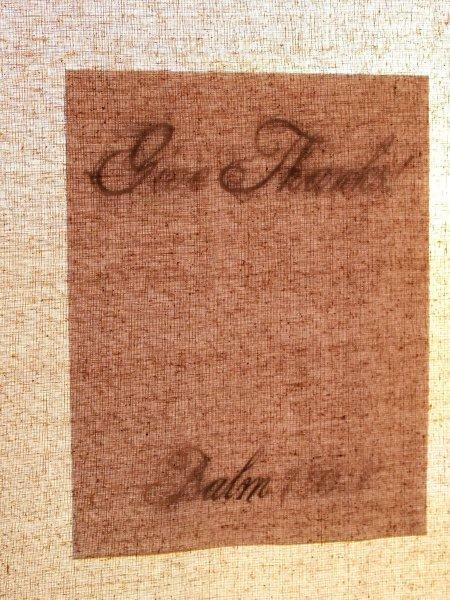 Here’s the download for the Give Thanks Embroidery. What a great idea, such a good things for kids to be thinking about what they are grateful for! This is great! 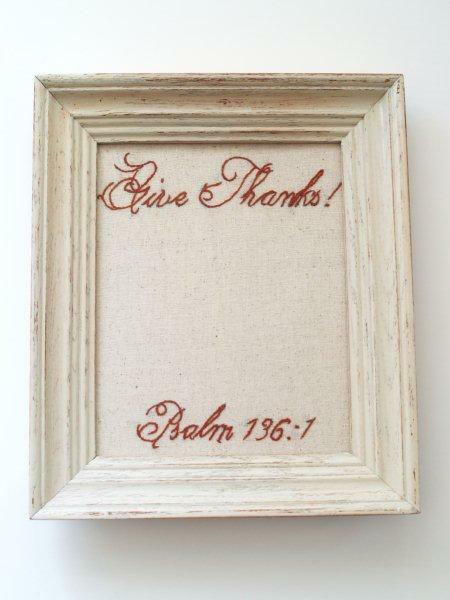 I am looking for some really cool Thanksgiving crafts. I can’t wait for all the yummy foods! Love this Bev! What a versatile idea! Love this idea! What a great way to remember throughout the month. This is beautiful! I wish I knew how to embroider. Thanksgiving is definitely my favorite holiday so I appreciate that you’re getting into the spirit! Super idea for those of us with limited memories ;) Well done and great tutorial! 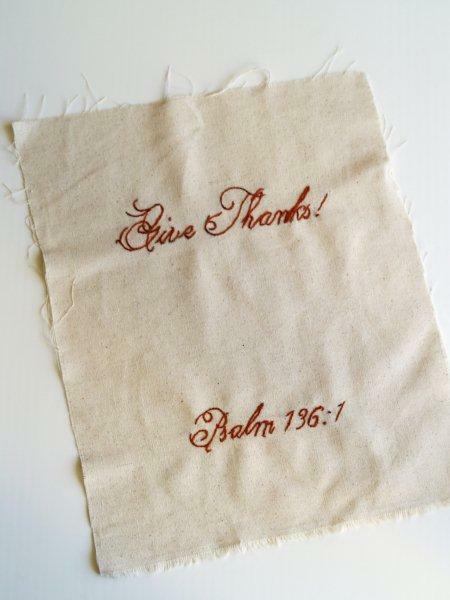 I give thanks for sweet bloggers that share their faith! This frame is wonderful!! What a blessing!! I’m tempted to make it and keep it up all year long… I love to count my blessings!! I just love your blog!! Really fantastic stuff on here!! 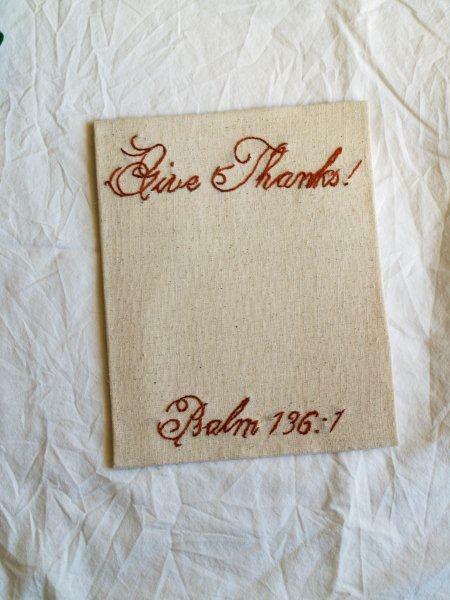 May the Lord continue to bless you and use you & your blog to spread sunshine, love & crafts!! You did such a great job! I think we have all tried this concept but visually it came out pretty tacky:( I LOVE yours!! I LOVE this. Wat a fun idea and anything you can write bacon and hot bloggers on it awesome! So simple and so pretty. Love this, thanks for the tutorial! thanks for linking up! See you next week! Fantastic idea! Love, love, love it! That is such a good idea! I love it! I will have to do this! 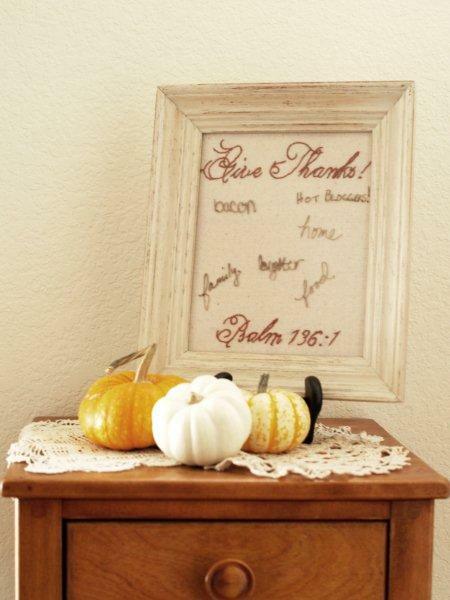 I LOVE that “bacon” is one of your thankful things, hysterical and just what my husband would write! I really like the placemats, but to be honest this is much more up my alley and more likely to be actually made. Thanks for linking it up to A Crafty Soiree! Such a beautiful idea! Bacon? Did my daughter drop by your house? This idea is just brilliant — the start of a wonderful family tradition, really. Love it! 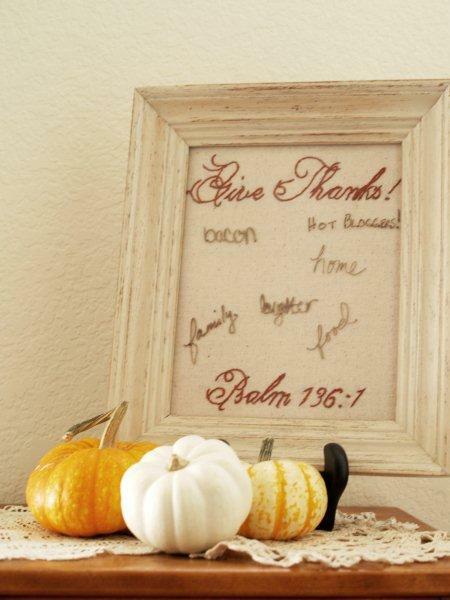 That’s a wonderful idea to write what your thankful for on it. Wonderful job! Another amazing craft! I think I feature you almost every week! Seriously, I need to set up a craft day with you. I love everything you do! I’ll be featuring you yet again this week. Thank you so much! This is the perfect elegant focus for my new brainchild… a family gratitude wall!